I am a man of habits, stability, and, maybe, random routines. It’s not that I hate change, I adore change in my life when I have full control over it, when I know how things in my life are going to take a new shape. If I’m not going to my favorite place for lunch, I’ll just need to make sure that the place I’m opting for is totally in line with my expectations. And even though the new place of my choosing satisfies my needs, I might just not like it. Because sometimes I just don’t feel like that place or restaurant, or anything in life. This is more of a certainty thing and change, at its best, isn’t associated with certainty. If something is going to change, it is very often not very clear how much or how it is going to change. Not being certain, I think, is what makes me dislike the concept of change or breaking a good old habit. But of course, I will try a new place around the corner (just like the McDonald’s that just opened up near my place few weeks ago), drink coffee at a Café other than Starbucks, or listen to a new podcast just for fun, watch a few videos on an unfamiliar YouTube channel. While doing all these, going to Del Mundo and ordering my pint is going to make me just as satisfied and happy, or just asking for a long shot triple Americano at Starbucks will effectively work out more than fine for me. Routine is just fine for me, maybe not very lavishly attractive for others. But things I have told are not the routines that make up most of my life, certainly they are the small things (referring to my secretive and untold little routines) that liven up our day. It is a routine of a lifetime, something so embedded into our lives that without it life itself might seem irrelevant. School. Or as Cartman calls it, skoool. There you go. Hell of a routine. A place, actually multiple places, where you went, spent time, made friends, fought over, had the happiest and (possibly) saddest memories in your life… A place of learning as well as sharing and interacting. Something you have been doing so long as you knew that you are here on this planet. First politics, love, drama of every sort, almost any human action that we know take place at skoool. (Yes, I love Cartman way of things, or just skoool.) We do it for almost more than fifteen years. I’ve done eighteen years of skoool, during which I changed multiple elementary schools (I guess this is why I hate changing things! ), had met great people, had some of my best years as a high schooler, learnt a terrific Germanic language and even mastered it, if I may say. Another four university years of skoool, one year in Germersheim, amazing friends and lecturers, many firsts… An unbreakable chain of a great many habits. An ordinariness I’ve gotten so used to that ending it seems not only plausible but also as something unfathomable, something that is definitely out of sight. In roughly two weeks, however, this ordinariness, or the catalyst behind my set of routines and habits, as I better call it, comes to an end as we graduate from university. In fact, classes are over even by now. The only thing we bear is what is left from class time, some articles to study before the finals and my graduation thesis. There is almost nothing else left about my Bachelor’s. For someone like me who likes the ordinariness of things, wishes an ordinary change of my life even in the face of unexpected events, graduation should feel like a nightmare. Everything in the known world of mine reaching its expiration date. Yet I don’t particularly feel much. Yes, I am sad that this huge skoool period is almost over and another unknown chapter is there. It is probably because I still don’t feel like I’m graduating. I’m really curious about what’s gonna come after and a bit worried about, you know, life thereafter. But what I’m currently enjoying is how my friends and I are going through different phases in our lives, feeling as if we are discovering a new celestial body. As I told you before, I don’t like change or ‘untamed’ change, or sudden change, or just not knowing. But getting into a new phase in my life gives me the wonderful opportunity to observe and grasp what we are going through and how we react, what we learn from it and, possibly, how we mature. Some of us are really worried about the prospect of not finding a suitable job, some, including myself, are likely to move to another city or country (hence, a range of endless possibilities), a few are getting their last shots of student-life with internships, some are dreaming to move out from their family households, many are considering their relationships and ponder what they will do… There are so many different stories here, most of which may be familiar to a lot of people who have graduated and seen these changes take place in their lives. But these are just as special and peculiar because this time, it is my friends who go through these stages of life, and of course, me. Just a few days ago, a few really close skoool friends of mine and I gathered at a local Café in Buca, which was supposed to be a gathering of all of us five in the last two months. It turned out to be a quasi-surprise birthday celebration for Ceren and me, as our mothers experienced the horror of giving birth to us only a few days apart from each other. It dawned on me as we walked back to our places in different neighborhoods of Buca that this thing, this life that I got used to, cafés where I meet with friends, the park that I go to for a quiet night-out (if you are a Bucalı, you know it’s Hasanağa), the streets that I run, various firsts of all kinds I experienced in my late teen-age years and early twenties (saying early sounds like I’m almost thirty but I’m a most teen-agery twenty-three year old who’s youngadulting at his best), and most of my university life is seemingly coming to an end in that friends, after they are done with Dokuz Eylül, my fabulous university, are planning to move to other parts of İzmir, or the country, almost no one staying in Buca. Things I love about Buca are there because of the people I love and care about, and I wonder if I will love the city just as much or my passion for it will diminish by time. I will, certainly, manage for the time I’m in the city but it will never be the same. Apart from all this melancholic talk, I must admit I love Buca. Hashtagging Buca in my Instagram posts is for the fun of it but at the same time I sincerely love this poorly planned wreck of a city. When I came back from Germany, I found another İzmir different from the one I left. My bestie and two roomies graduated only a few months prior to my homecoming. Despite this sudden change for me, I somehow caught up with life and made new habits, saw how my ex-Symrniots went on with their lives and experienced the changes in their lives almost first-hand as we stayed in touch, even though I was melancholic during the first few months back home. I learned a lot from these exchanges, to be honest. I understood during my semester abroad, when my bestie uploaded a picture of us two on her Instagram with the caption “I have so much to say but you’re so far away,” that you can be just as close. Distance or differentiation in life conditions separate people but we still share the same roots and, to some extent, the same feelings. This time, when the Bachelor part of my skoool ends, I will, for sure, experience a much bigger change in my life. Yet all of us will have new opportunities to make new habits, new routines, and new things in our lives to share with our friends, and looking back we will, I’m certain, see that we are who we are because of who we met, how we were together and what we did together. Uncertainty will prevail for some time till I get back the full control of my life and steer it as I wish. In the meantime, I will only look forward and enjoy my secretive routines as before and then, hopefully, begin the next stage of my skoool life. Is Turkey A European Country? Turkey has been a topic of various discussions, mostly because of the political situation in the country as well as its relation with the ongoing crises in the Middle East. Most people view Turkey as a Middle Eastern country, some say it is European. Technically, Turkey is a Eurasian country, as it has land both in Asia and Europe, just like The Russian Federation. But we do not use this term because it is most of the time out of context when we talk about Turkey. And geographical location of any country is not much of use in describing a country or a cluster of countries. Take Middle East for example. Egypt is a North African country but is considered a part of the Middle East by most people. Turkey is part of the Middle East even though it has a tiny land in Europe. Cyprus is a EU member but it is in the Middle East. Categorizing countries as we do is totally a human invention and we do it on certain factors, which do not make sense when we consider geography or just look at the map. This invention is driven by history, international relations, religions, and to some degree, geographical location. Defining Turkey as European or Middle Eastern is no different. Let’s find out the reasons why this Eurasian country is European or Middle Eastern, or both. Turkey is located both in Asia and Europe. Anatolia, the Asian part of the country, is a peninsula making up ninety-five percent of the landmass. The rest five percent is located in the Balkans, called East Thrace (in Turkish, Trakya). Geographically speaking, Turkey is a Middle Eastern country. Most of its neighbors, Syria, Iraq, and Iran, are in the Middle East compared to Greece and Bulgaria in the Balkans, and Georgia and Armenia in the Caucasus. (Nakhchivan, an exclave of Azerbaijan neighboring Turkey, is probably more Caucasian than Middle Eastern, but let’s keep things simple.) Turkey is surrounded by three seas, the Black Sea, the Aegean Sea, and the Mediterranean and has an inland sea, the Marmara Sea. Turkey’s position in the world is between the crossroads, the Arabian Peninsula and the Mediterranean to the south, the Balkans to the west, Asia and the Caucasus to the east. But if we were to take geography as our source of determining the country’s middle-easterness or europeanness, it would definitely be defined as Middle Eastern. 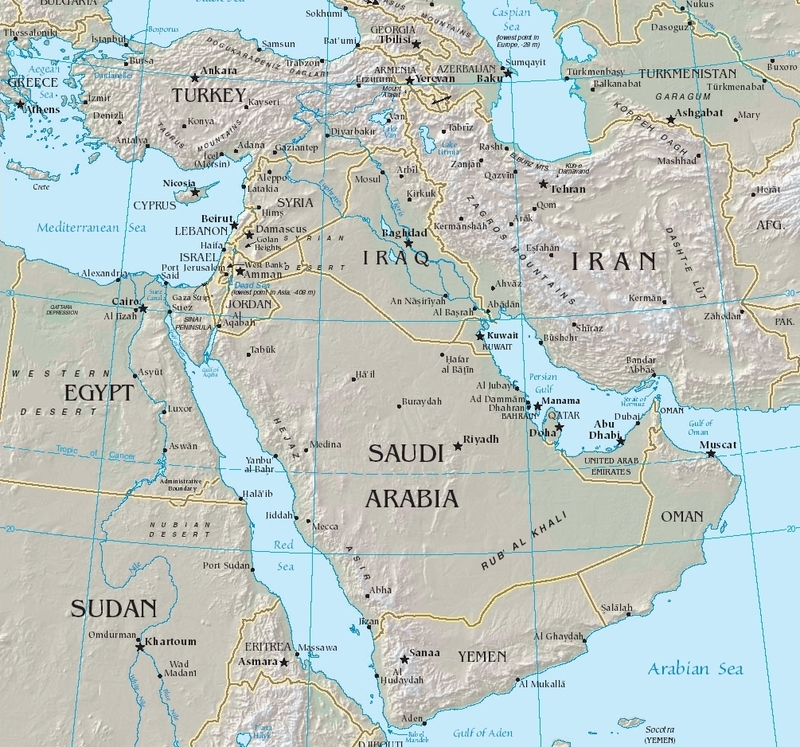 Its geographical location is mostly in what we consider the Middle East, the majority of neighboring countries are in the Middle East or in Asia. In this respect, it is a given that Turkey is geographically a predominant Middle Eastern country. But geography alone is not a factor when we define Turkey’s geopolitical status or that of any other country. The only reason why we ponder on this question is clearly because of Turkey’s distinctive and significant geopolitic location in the World. It neighbors the Fertile Crescent, where the first signs of any civilization is known to have appeared, the Black Sea and the Medditerranean are connected through its straits. It connects the Caucacus to the Balkans, it provides the most direct land route from the Persian Gulf to Europe. Just before the thirteenth century kicked off, Turkey’s predecessor, the Ottoman Empire, was founded in western Anatolia as a Beylik. Back then, there were several Turkish Beyliks on the peninsula. The Ottomans were lucky in that they were on the western frontier neighboring the Eastern Roman Empire, while most other Beyliks were fighting for power among themselves, Ottomans were conducting raids against the Byzantines and expanding westward. The Ottomans were lucky in their fight against the “infidels” on their western border, as a result of which they avoided the rivalry among the Turkish beyliks on the peninsula. Ever since its foundation, the Ottomans extended their territory mostly wesward. Even today, we can observe this expansion by looking at Ottoman monuments in Anatolia, apart from Western Anatolia, there are not many Ottoman remains in the rest of the region, whereas one could see numerous examples of Ottoman architecture all over the Balkans. The peak moment of the Ottoman expansion was when Suleyman the Magnificent sieged the city of Vienna in 1529. This westward expansion proved to be not only territorial, especially after the French Revolution. Western ideas began sneaking into the Empire, that is people in the Empire became more familiar with what’s happening in the West, as of end of eighteenth century, especially under the rule of Selim III. Alemdar Mustafa Pasha, a commander in the Ottoman Army, was one of the pioneers in the Empire who helped Mahmud II ascend to the Ottoman throne, a Sultan that modernized the Empire with Western ideas. This was due to the developments in Western Europe now known as the Enlightenment and the Renaissance, and military defeats the Empire suffered. The need to ‘reform’ the Empire was felt when the Empire wasn’t doing well enough militarily. The first reforms, hence, were done in the Army. Reforms in other parts of daily life and affairs across the Empire were unfolded throughout the the nineteenth century to keep up with the West. The Tanzimat era began with the reign of Abdülmecid I in which a vast number of social and economic reforms were carried out. First post offices were introduced, finance system of the Empire was remodelled after that of the French, ID cards were issued and so on. These reforms and translations of Western literature gave way to establishment of certain institutions and ideas that took a firm root in the Republican era, the first parliament was opened during this century, first Western literary genres were introduced and a great deal of French words started entering Turkish around this time. When the Ottoman Empire collapsed after its defeat in WWI, the newly founded Republic undertook a series of modernizations and aimed to institute a series of reforms what we can refer to as ‘westernization’. So, Turkey is, literally, in the crossroads where many different cultures meet and probably it is one of the earliest ‘melting pots’ in the world history given its closeness to the Fertile Crescent, Mediterranean, and the Caucusus. And as a country, it has been influenced by pieces of Perso-Arabian culture to ideas from the West. There can be found many examples of these interactions both in the country in the form of monuments, architecture, but also in the Turkish language itself or the customs and traditions in the country. Since it is located in a diverse region, it is quite not possible to refer to the whole country as European. But if we take a look at its history, one might possibly say it is partially (and maybe, historically and politically) European. But again, that depends on where you look at the matter. Author genagePosted on December 9, 2017 July 31, 2018 Categories Politics2 Comments on Is Turkey A European Country? Being a sophomore, I was chasing my dream to study abroad, at least for two semesters. There are quite a number of different exchange programs that connect schools in various countries but for most university students in Europe, it is Erasmus, a phenomenon unto itself because it has been around for thirty years now. For most, it is a semester abroad when you can take some of your time and make most of it by traveling to various destinations on the continent, along the way making new friends and having new experiences. Some study abroad with Erasmus because they want to increase their language skills in a more connected Europe that the alt-right loves to attack (more or less, I happen to fall into this category). Others just want to experience studying in a different system or country or a new culture. Some students live for parties, Erasmus parties, especially if they are in a big international city during their exchange semester. So even though there is one program that operates in Europe (certainly there are others), there are so many Erasmus experiences, ways of seeing and identifying these experiences that it is maybe possible that we define subcultures within the program. ERASMUS actually stands for “European Region Action Scheme for the Mobility of University Students” — Just. Give me. A break. One probable subculture revolves around Erasmus Student Network. ESN groups organize events, trips, and of course with no doubt, parties. Not only outgoing exchange students but also regular students partake in these activities, help incoming students find accommodation, sign up for courses or classes, and explore the city, campus. Most students build really strong bonds and friendships during their semester abroad. All this craze, in the end, entice university students. They want to go and spend some time abroad for various reasons, led on by possibilities that have been diffused by ex-Erasmusees. I knew of Erasmus well before I started studying German at a prepschool. But it was a friend of mine as a freshman, who had done Erasmus in Poland, who motivated me with the idea of studying abroad, especially in Germany, giving hints about how it would help me improve my baby German. In my first try as a sophomore, I could not succeed in the exam well enough to be placed into a partner university, which, later on I realized, would turn out beneficial for me. Fast forward to my fourth semester in Izmir. I showed up on the list of students that were selected as outgoing students according to a special grade point average of a language exam and current GPA. My name followed the university of Johannes Gutenberg Mainz. The faculty I was going to study was, however, not located in Mainz, which would later occur to me and a classmate from Izmir as an unpleasant surprise, who was also going to attend this school with me. This town is where we would study our Erasmus semester. After having read about Mainz for awhile, it took not much time until we realized everything about this faculty, FTSK, was different from the main campus. Even the website, FTSK has its own Buddy Project, its own Erasmus page, its own everything. Because this faculty is one hundred and nine kilometers away from Mainz. So every thing I thought about before coming to study at FTSK was all of a sudden void. Then I searched about Germersheim, or Germersche, as locals name it. To be honest, the town seemed to catch no interest from me, even though I was somewhat curious. Reading about it online, I knew it was by the Rhine River, it had a very small population of twenty thousand people, and it is home to FTSK. One thing puzzled me, however, most, how would you travel to such a town that is so away from any international airport, which, of course, was a no brainer. It wasn’t so small that even DB would not operate here. After a series of unfortunate events, we arrived in this small town. My first impressions of Germersheim was mostly about my first impressions of Germany, but it is a fact that those were genuinely my impressions of Germersheim. In the center of the town, I liked the smalltowniness of buildings, parks, cafés, pubs and even roads, houses that are close to and at Kirchenplatz are my favorite buildings in the town. I loved walking on the path along the creek when you pass the post office towards Amadeus, my favorite pub. Walking to the Rhein River, finding yourself in nature only after ten minute walk from the town center, going to the lake nearby (towards Sondernheim) and, most importantly, only taking fifteen minutes to go to class made me love this small place. It took no more than a week to see most parts of the town and try most cafés and pubs. There is literally no night life here, no one should expect that from a small town, but it is the situation in most places in Germany, if you are not in Berlin, Munich or any other big city, as most businesses close at 7 PM. In Germersheim, Allegro, which is located at Königsplatz – town center -, is the best café to drink a coffee and study, or chat with friends. It has a cozy and comfortable atmosphere. You should not eat here, though. We had breakfast here twice after arriving, which was good but pricey. My favorite pub is Amadeus, whose only downside is that it is a smoker-friendly pub. You stink once you get in. But most places in this town allow indoors smoking. If you are in Germany, one of the best fast food you can get is obviously a döner. And Germersheim hosts five döner shops. The best döner in town is definitely served in K2. City Döner, which is very close to the university, has the best pizza. There is also a McDonald’s and a Burger King in town, but you have to walk to the Industriegebiet for a BigMac or a Whopper. Finding accommodation was a last minute issue for us as we were sure that we would be given a room at university dormitory. But we were not. There are several Facebook groups where you can easily find a Wohngemeinschaft, or WG, which is basically a shared flat, and there is of course wg-gesucht.de. I opted for the other dormitory owned and operated by a local housing company. The dormitory is a bit far away from the university, a maximum fifteen minute walk, but it is very close to the main train station, from which it actually derives its name, Wohnheim am Bahnhof. The only disadvantage of this dormitory is that you have to pay a three-month rent as an exchange student. This dorm is quite advantageous because of its closeness to the main train station, since Germersheim is small and you will want to travel. Lidl, a German supermarket chain, is also very close, so is Real, a German ‘hypermarket’, in other words, a department store in a supermarket form. Sharing a kitchen with seventeen people can be a hurdle but student life is far from perfect. Erasmus has come to an end for me over a week ago. But I still cannot come to grasp that this wonderful experience has ended. A semester abroad is really more than just a semester not only because of challenging circumstances of adopting to a new language, faculty and country but also it brings students all across Europe and help them build new friendships, experience and each others’ differences, and see what unites us all. We all have grown to a newer (and, hopefully, wiser) version of ourselves. Germersheim is small, and it sure made every big thing smaller for us. I will truly miss it and everything we have had here. genage on Is Turkey A European Country? M.b. on Is Turkey A European Country?